The Donskoy, also known as the Don Sphynx, the Don Hairless, and the Russian Hairless, originated with a single rescue kitten. 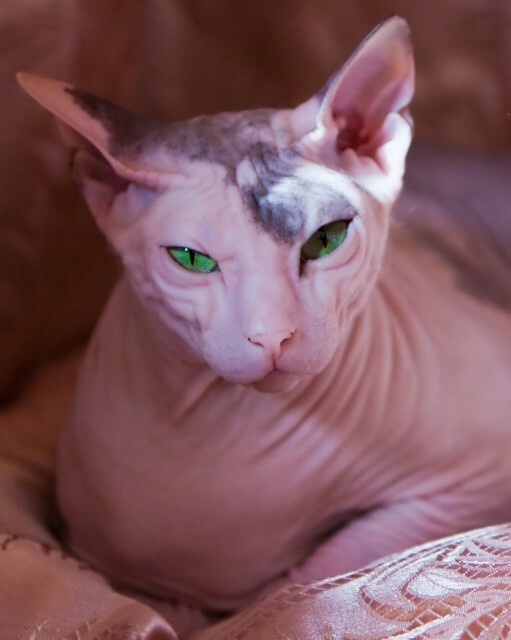 The Donskoy is considered a hairless cat breed, though some Donskoys have either patchy fur or very short peach-fuzz fur. Donskoys have a wizened or alien appearance due to their almond-shaped eyes, enormous upright ears, and wrinkled skin that has the texture of soft suede or leather. The Donskoy is a medium-sized cat with an elegant, muscular build and long, tapering tail. Its back legs are longer than its front legs, a good feature for jumping. Donskoy paws are oval with long slender toes. Thumbs bend toward the paw pads rather than downward, creating the appearance of a monkey hand. As with most breeds, male Donskoys are typically larger than females, and can be differentiated by their thicker necks, broader shoulders, and wider heads. There are four Donskoy coat types available in a broad array of colours. Some Donskoys grow a winter coat of fine woolly fur on their chests and the ends of their tails, losing it when temperatures rise again in the warm season. The gene triggering baldness in Donskoys is dominant, so even if only one parent has the hairless gene, it can be passed along to kittens. 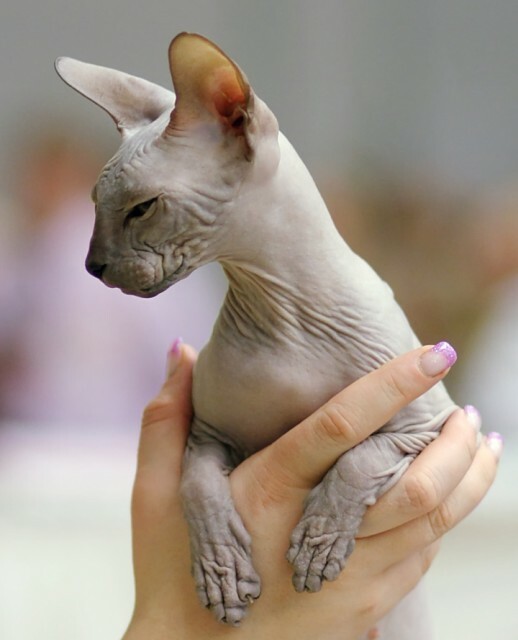 This differentiates the Donskoy from the Canadian Sphynx, which is hairless due to a recessive gene. The first Donskoy was a stray that had the good fortune to be rescued by professor Elena Kovaleva in 1987. When Kovaleva found some boys tormenting a kitten in a bag, she took the kitten from them, adopted her, and named her Varvara. Not long after the rescue, Varvara began losing her fur and Kovaleva worried that the kitten was ill, but various veterinary treatments failed to restore Varvara’s coat. Varvara eventually gave birth to kittens of her own, some furred and others hairless, and even the kittens that were born with fur began to lose it at around the same age as their mother had. A cat breeder named Irina Nemikina took an interest in one of these kittens and used it as the foundation cat to establish a new breed called the Don Sphynx (Varvara was found near the river Don and Sphynx is associated with hairlessness in cats). However, The International Cat Association chose to list the breed as the Donskoy, which became its official name. The Donskoy is a playful, cuddly, sociable breed, extending its friendship not only to people but also other household pets (though an adult Donskoy may have trouble accepting some another adult cat – compatibility will depend on individual personalities). Affectionate and highly interactive, Donskoys shouldn’t be left alone; ideally, anyone adopting a Donskoy should adopt a companion for it at the same time. Donskoys tend to be friendly and good-natured. They are also clever, inquisitive, active cats, spending much of their waking time on the move. Most Donskoys are quite pliable and tolerant of procedures such as nail trimming, bathing, and veterinary check-ups. They are less likely to scratch or bite people than cats of many other breeds. Because they lack fur to keep them warm, Donskoys shouldn’t live in draughty places. They can also scratch their skin on rough objects more easily than other cats because they don’t have a protective coat. Donskoys enjoy lying in the sun and can actually get a tan, but they’re at risk for sunburn on their exposed skin. Given their vulnerability to sunshine and chilly temperatures, Donskoys should be indoor cats. Other than the cold and sun sensitivity associated with hairlessness, Donskoys tend to be robustly healthy and there are not any serious health problems associated with the breed. A couple of websites suggest that ectodermal dysplasia (a condition causing abnormal tooth development) may be more prevalent in Donskoys, but thus far there appears to be little solid evidence to support this speculation. Donskoys do require some special grooming due to their hairlessness. Because they have no fur to absorb the natural oils of their skin, they should be wiped once a day with a cloth and bathed weekly. They should also have their ears cleaned regularly. Pet-quality Donskoy kittens cost anywhere from a few hundred dollars to around $1,000. Breeder quality kittens are usually $1,000 and up, and show quality (those with perfect features that most closely match the breed standard) are typically priced above $1,500. If you are interested in a rescue cat, the Rexcue Railroad assists with transporting rescue cats, often to North America. They primarily deal with Rex cats, but sometimes help with the rescue of other breeds such as Donskoys, LaPerms, Peterbalds, Sphynxes, and American Wirehairs. There are a number of additional organizations listed on the Purebred Cat Breed Rescue site as rescuers of many different breeds, including Donskoys. Some people are interested in adopting hairless cats such as the Donskoy or the Sphynx because they believe that these cats will be hypoallergenic. Although certain allergy sufferers are better able to tolerate hairless breeds, Donskoys will still trigger allergies in some people. The only way to be sure is to spend time with the cat to be adopted beforehand. Amur Alien Tresor Cattery. (n.d.). “What You Might Ask Is A Donskoy?… Is It a Cat, Really?” AmurAlienTresorCattery.com. Best Breed for Me. (n.d.). “Don Sphynx.” BestBreedforMe.com. The International Cat Association. (n.d.). “Donskoy.” TICA.org. The International Cat Association. (2008). “Donskoy Breed Standard [PDF].” TICA.org.